The Veil of the Temple is a huge conception. The full version plays for 480 minutes, according to the Chester Novello website www.chester-novello.com. I believe the full score consists of 850 pages! What we have here is a recording of the concert version which Tavener made and which was performed by these same forces at the Henry Wood Promenade concerts in London on 1 August 2004. I vividly remember listening to that performance on the radio. The music made a huge impression then but that impact is as nothing compared to what one experiences when one can follow the libretto and read about the piece. Back to the music. As I say, this recording is of the concert version but the performance was set down at the two overnight première performances of the full score (only the last two sections, Circles VII and VIII were played on 1 July.) This, I think was a very sensible and practical way to make the recording. I wonder how much of the recording of Circles VII and VIII stems from the 1 July performance for the performers. Stephen Layton in particular, must have been very tired by the time they reached the end of the full performances but there is no audible trace of weariness. Mind you, I�m perfectly prepared to believe that the lack of tiredness might be due simply to inspiration and adrenalin rather than to editing. I�m an admirer of Tavener�s music, albeit not an uncritical one. Sometimes I�ve had doubts about his larger-scale works. For example, We shall see Him as He is, the world première of which I was lucky enough to attend in 1992, has always seemed to me to be very successful. Similarly Lamentations and Praises (2000), written for Chanticleer. However, I�ve still to come to terms with Fall and Resurrection (2000). The Veil of the Temple, at least in this concert version, strikes me as being a great achievement, not least in its cumulative power. The cumulative effect is key to an appreciation of the work, I think. Writing in The Daily Telegraph immediately after the première of the full score, the respected critic, Ivan Hewitt said: "It�s not that Tavener has discovered some new voice � more that the familiar one was given a cogency I�d never heard before. The piece is, above all a masterpiece of pacing, beginning in a modest way with a handful of singers and instrumentalists, and building with inexorable control to a mighty climax with what seemed like hundreds of performers. Thirteen months later, after the Proms performance of the concert version, Mr. Hewitt had this to say in the same newspaper: "�the piece seemed stronger than ever�.the iron grip of the form, and the telling economy of the music � and its profound beauty � made it a profound experience." I can only agree with his verdict even though, unlike him, I haven�t heard the vast complete score. I would just add that like Arvo Pärt�s St John Passion this is a work that only reveals itself fully when one reflects on all the music at the end. Though there are copious tracks on the CDs I�d strongly advise listeners not to sample the music. Instead, set aside 2 � hours and allow yourself to be led on what Tavener calls a "journey to the Centre." The forces required to perform The Veil of the Temple are substantial but it�s only towards the end that the full ensemble is united (nearly 200 singers surrounded the audience at the amazing climax of Circle VIII, with the instrumentalists in the middle.) Two mixed choirs are required in addition to the vocal soloists listed at the head of this review. The instruments include a duduk (an eastern reed instrument that sounds rather like a combination of cor anglais and saxophone.) This always plays with the soprano soloist. There is also an important part for organ. An Indian harmonium is required and the percussion section consists of Tibetan temple bowls, tubular bells and tam-tam. Telling use is made of a Tibetan horn which sounds, accompanied by tam-tam, between each of Circles I to VII. Finally, at the end of Circle VIII Tavener adds a septet of brass players. One other thing to say about The Veil of the Temple is that for all its length the musical material is not that extensive. Helpfully, the booklet lists all the sections of each Circle, distinguishing those sections that Tavener has excluded from the concert version. I must admit to just a little confusion here. Tavener himself writes that only Circle II has been included in full in the concert version, with parts of all the other Circles retained. However, the layout of the text in the booklet implies that Circle VIII, which runs for about 30 minutes in this recording, is also complete. A look at the sectional listing of the entire score shows that Tavener includes settings of the same text in more than one Circle. This, however, is not simple repetitiveness, I think. There are some sections that are frequently repeated, by design. One very important example of this is the simple chordal setting of the word "Lord Jesus Christ, Son of God, have mercy on me." This recurs throughout the score but as the work develops so the music is sung at different dynamics and with an ever-increasing enharmonic richness. There are a number of longer texts, prayers or extracts from scripture, which recur. However, judged by the instances on this recording, the texts are expanded in length as the work progresses and also the music increases in sophistication and richness. I�ve tried to give some background to this daring work. What of the music itself? Let me just point out what for me were a few highlights. The very opening is other- worldly. The soprano soloist intones some words by a thirteenth century Sufi mystic. She sings unaccompanied, with the duduk commenting, as it were, on each of her phrases. Heard in a resonant, darkening church this music must make an indelible impression. After this we hear for the first time the short "Lord Jesus Christ" motif, to which I referred earlier. Tavener has apparently extracted four choral anthems from the score for separate performance and publication (they�re listed in the booklet.) All four are heard for the first time in Circle II. However, there are more extended versions of all four later in the work and I would imagine that it is from the longer versions that Tavener has drawn his separate anthems. All of them will be welcome additions to the choral repertoire but I can easily foresee one of them, �Mother of God, here I stand� becoming especially popular. It�s a rapt and very beautiful piece that radiates a simple, sincere devotion. It�s vintage Tavener. Circle II also includes a setting of The Beatitudes of St. Isaac the Syrian. Imaginatively, Tavener scores this for unison treble voices alone. The music is surprisingly lively but this and the purity of the boys� voices splendid conveys innocent joy. In the music of Circle V there�s a discernable stepping up in terms of exaltation. The music has a new richness and intensity even though much of it continues to be slow-paced. The Primordial Call on the Tibetan horn with which Circle VII opens is huge; for the first time (I think) the organ underpins it in addition to the tam tam. In this Circle there�s an increased amount of ecstatic choral chanting, which contributes hugely to a feeing that fervour is mounting. The Primordial Call that opens Circle VII is justly described as "Apocalyptic." In telling contrast this is immediately followed by the reappearance of the soprano soloist and the duduk for the first time since the whole piece began. The Circle, as here presented, culminates in a fourteen-minute setting for unaccompanied solo tenor (Simon Wall) of the passage from St. John�s Gospel that immediately precedes Christ�s Agony in Gethsemane ("Father, the hour is come, glorify thy Son that thy Son may also glorify thee"). This extraordinary setting is a real tour de force for the soloist and Wall sings it superbly. I haven�t begun to do justice to this extraordinary, visionary work in the above paragraphs. I remember vividly a review written many years ago in Gramophone magazine by the late Felix Aprahamian of the first ever recording of Messiaen�s La Transfiguration. He described the reaction of a friend to whom he had played the recording; "I felt as though I was in the presence of God." The Veil of the Temple may well have the same effect. It is fashionable in certain quarters to dismiss Tavener as a "Holy Minimalist." If that barb were justified (which I don�t think it is) then it certainly doesn�t apply here. This is a moving and very considered work of art and I rejoice that it is available on CD to a wide audience. The original commission came from The Temple Church and is rightly described by Tavener as "daring." 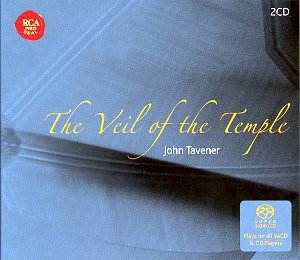 Despite the popularity of Tavener�s music it is also daring of BMG to have issued this recording. I hope their enterprise is rewarded by large sales. I�ve said much about the music but little about the performance. Suffice to say that it is wholly worthy of the music. The singing and playing is superb and Stephen Layton directs with dedication and total commitment. The recorded sound is superb and very atmospheric. As I�ve already said the documentation is some of the best I�ve seen in a long time. This release is a major event. I cannot recommend it too highly.